The design of your office space – free flowing, open, cheery – is prone to sound leakage from conference room to surrounding areas. Unless you built the room like a recording studio, what is said in the conference room or board room is heard outside. You are broadcasting trade secrets, plans, strategy, the underpinning of your business. Even if not critical information, board room discussions are distracting for those outside, in the hallways and work spaces. Cambridge Sound Management has a perfect solution in the form of the Qt Conference Room Edition. Sound masking, a long-standing approach to increasing acoustic privacy and reducing distractions, in this case is applied to the area around the conference room. A subtle sound resembling a smooth HVAC flow of air is widely dispersed outside the conference room from tiny ceiling-mounted speakers, called emitters. Room occupants activate the system at a meeting start, or it can be left on all the time. Status signs confirm that privacy is intact for meeting room participants and for those outside. The price is reasonable, too. 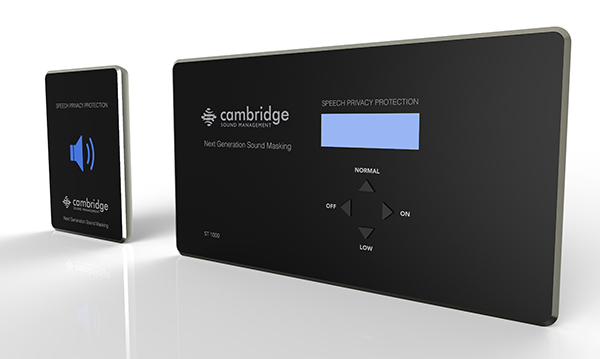 CSM’s patented direct-field technology makes the installation straightforward and non-invasive. The system is appealing for the corporate team using the space, and it’s good business for the architect, consultant, or professional AV installer who focuses on board rooms and commercial spaces. CSM can provide you more information at CambridgeSound.com. This entry was posted in Marketing and Sales, Product Design, Reviews and tagged Cambridge Sound Management, conference room, Quiet Technology, Sound Masking by Stephen. Bookmark the permalink. I’m happy to report this product received US Patent 9,666,174 on May 30, 2017.